Everyone carries at least one type of insurance policy, whether it be automobile, homeowners, health or life insurance. We purchase insurance to protect us against the unexpected catastrophes of life. Many of us see our firearms that we carry every day is an insurance policy all by itself, protecting us against the unexpected and those who would harm us or our loved ones. What we must think about is the aftermath. 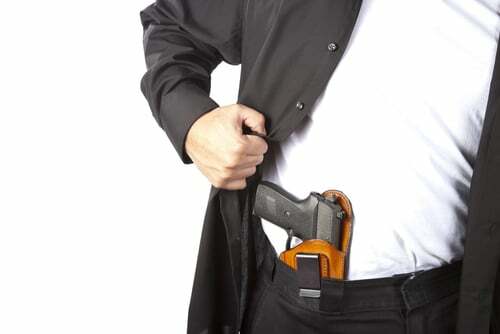 What happens if the unexpected happens and we use our concealed carry firearm in self-defense? More importantly, what happens after this event. We see this happen frequently across our country, most evident in high profile cases such as the George Zimmerman, Treyvon Martin case. In this case was a classic example of a legally armed citizen using his gun in self-defense then winds up appearing in court to prove that the legal requirements were met to justify using deadly force. When the court rules a citizen complied with the law and is not guilty of any crime life goes on, right? It’s not always that simple. Any court case you are involved in will result in you spending tens of thousands of dollars to protect your freedom and clear your name. In some states once you’re cleared of all criminal charges, the family of the deceased might take further action to sue you in civil court for wrongful death. Once all of that is over even if you are not found liable for damages, you will still face a pile of legal bills in the process. With the expansion of concealed carry in the United States, even in some of the most liberal states, insurance providers are not offering concealed carry in self-defense insurance policies. There are many coverage options that are now available from a number of providers, covering an abundance of factors that all need to be considered when choosing a self-defense insurance plan. If you have a homeowners policy the first thing you should do is to speak with your agent to find out if there is any coverage you may already be entitled to three or homeowners insurance policy. Most homeowners insurance policies have clauses that may either enable or prevent your current plan from covering you in a self-defense situation on your own property. It is important to speak with your insurance agent to find out what kind of a coverage, if any, is included in your current plan. It is of the utmost importance to study the state laws where you reside. Many states have stand your ground laws that protect individuals against civil suits and lawful self-defense scenarios. Also known as the Castle doctrine law these laws help make it unlikely that you will face a civil suit when rightly defending yourself. Under the circumstances that you are covered by the stand your ground or Castle doctrine law, it may not make sense to pay a premium for insurance coverage. However, if your states laws don’t favor self-defense scenarios you may want to seriously consider an insurance policy that covers civil lawsuits. It is important to note that as a CCW citizen that it is very important to stay abreast of the laws in your state. Residing in a liberal state understanding that our politicians are constantly changing the laws, and their legislation is ever-changing, it is of utmost importance to stay abreast of the laws in your state. Next, consider the different levels of insurance coverage offered. Most companies such as the NRA insurance, offer varying levels of insurance coverage. USCCA insurance policies offer more than one level of protection. The more you pay monthly or yearly, the greater amount of civil and criminal coverage you may be entitled to during a trial. It is important to note that, for criminal trials, most of these plans only offer reimbursement for the money you spend defending yourself. There are several insurance plans that will not provide money up front for a criminal proceeding and will only pay out if you are found not guilty. Many plans will cover your legal bills for civil cases up to the plan limit. It is very important to carefully consider how much coverage you feel you might need based upon where you live. Going to court in one state versus another can be a much difference experience, and will lead to vastly different costs. If you are ever caught up in a high profile self-defense case, such as the Zimmerman/ Martin case, many policies would only cover a fraction of your criminal proceeding costs. In the final things to consider when choosing a concealed carry insurance plan are any additional features included in the plan. For example, find out whether the plan will cover fees for expert witnesses and whether those fees are provided upfront or reimbursed later. Also, always find out if the plan provides an attorney for you or if it allows you to pick an attorney whom you feel will represent you best. Also determine if the plan covers your family members during this self-defense incident within your home using your firearm. Many plans also provide a network of resources, such as expert witnesses, for use in your trial. When purchasing CCW insurance it’s important to research the different plans that are available and choose one that you’re comfortable with and that closely fits your needs. There is not much in the way of readily available information detailing customers individual experiences with the varying insurance providers. Some states even have their own insurance plans. Texas offers its own plan called the Texas legal protection plan. Check with your home state to see if they offer a reasonable insurance plan that will fit your needs. Hey Buddy!, I found this information for you: "Concealed Carry Insurance". Here is the website link: https://thegunrights.com/concealed-carry-insurance/. Thank you.